This issue covers each of the 42 houses designed by Atelier Bow-Wow, a practice established by Yoshiharu Tsukamoto and Momoyo Kaijima. To illustrate the idea of ‘House Genealogy,’ all projects since 1990 are accompanied by sketches, which together with the texts, are intended to form a single narrative. Produced especially for this issue, the sketches allow the architects to reflect on how changes in the environment have inspired their work. They become critical representations that show the development of a new line of inquiry, revealing as much about their practice as it does about the Japanese city. 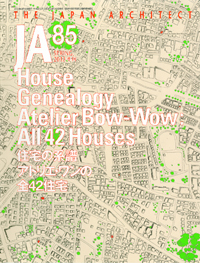 The cover is a collage of Atelier Bow-Wow’s houses, all brought together with a consistent orientation. Though not real, the image could just as well be that of the contemporary city.